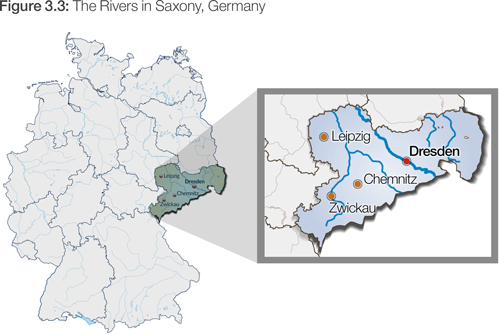 In August 2002, severe floods affected practically two-thirds of the German state of Saxony (Figure 3.3 illustrates the rivers in Saxony, Germany). This disastrous event led to the development of the Flood Protection Investment Programme, which comprises 1,600 individual flood protection measures and 548 flood risk maps for all communities at risk. A statewide risk awareness campaign was also launched. To better communicate on flood risks, in collaboration with the Ministry of Saxony, the German Insurance Association (GDV) developed an online geographic information system, ZÜRS Public, where homeowners, tenants and businesses can see an exact calculation of the risk exposure to flooding, backflow, torrential rain and earthquakes of their individual address.13 While similar to other systems, such as Tiris in the Austrian region of Tyrol, it is innovative in its triangulation of data from insurers, the government and some 200 water management agencies across the federal states.14 The results of this online risk information tool are easy to understand and free of charge. The initiative aligned the interests of all stakeholders and illustrates the importance of risk communication. Citizens benefit by understanding more about their individual risk exposure. The insurance industry is incentivized to participate as the tool encourages households and businesses to think about their need for insurance. The state also benefits from individuals and businesses taking greater responsibility for risk prevention, both through private insurance and investment in physical prevention measures, as it reduces their potential liability in the event of disasters. To raise awareness further, the state government transparently publishes information online about applications for and disbursements of public compensation for private damages.